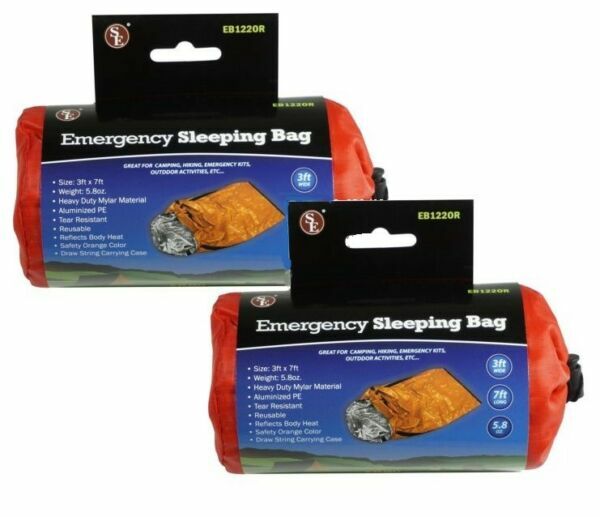 eBay 2 Pack Heavy Duty Emergency Thermal Sleeping BagNever be caught in the cold. The Emergency Sleeping Bag helps retain body heat and provides protection in all weather conditions. Lightweight and Compact - Our Heavy duty Emergency Sleeping Bag is built to be tear resistant, durable and long lasting for multiple purposes. This Sleeping bag can also be used as a rain shield for Camping Gear , Ground Cover and as a Reflective Warmer.Specifications:• Dimensions: 3ft x 7ft (36 x 84 inches)• Height : 5.8oz • Safety Orange Color• Heavy Duty Material• Aluminized PE • Tear Resistant • Reusable • Reflects Body Heat • Adjustable Drawstring Included • Great for Camping, Hiking, Emergency Kits, Outdoor Etc.